I’m not wearing anything maternity as my regular jeans, Cherry from Oasis, are a bit lose. 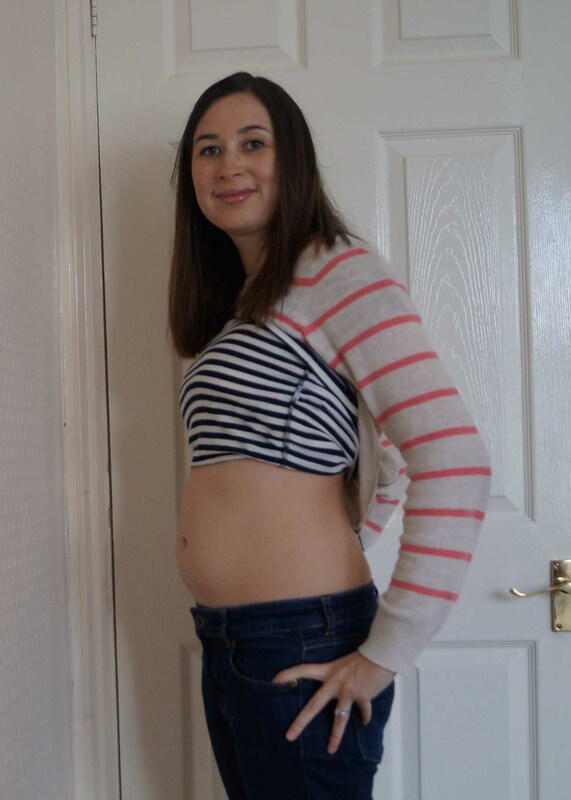 During my first pregnancy I had already started wearing maternity trousers from about 9 weeks as my stomach felt really tight and my ribcage started to feel as though it was expanding. I’ve gained: I started at 60kg which is 132lbs but with the Hyperemesis gravidarum I’ve lost 13lb/6kg. How I’m feeling: I’m generally feeling ok. A bit queasy throughout the day but the tablets are working for the majority of the time. I get tired quite quickly and I’m often in bed by 10pm. If I have been ill, I occasionally need a nap afterwards. Annabelle doesn’t nap everyday anymore so sometimes I’ve to ask Andy or my mum to look after her while I ‘recharge’. Highlight: The 12 week scan. It’s always exciting to see the baby and he/she waved to us. It was my second scan with this baby and the difference between 8 and 12 weeks is amazing. At 8 weeks the only movement I saw was the heartbeat but this time it was rolling around. The baby is: A naughty baby! We needed to measure the fluid around the neck to test for Down’s syndrome but the baby wouldn’t lie in the right position despite much jigging from me and prodding from the sonographer. Food cravings: Sweet and sour foods and flavours. I know I shouldn’t drink fizzy drinks so I limit myself to a couple a of cans a week of lemonade or cola. Sometimes I’ll drink Tropicana orange and lime juice with soda water if I’ve already had my quota for the week. I’m enjoying a lot of Halloumi, salad and red liquorice (not together, of course!). Symptoms: Queasiness, a bit of indigestion and sometimes feeling dehydrated but unable to drink a lot as it makes me feel queasy. 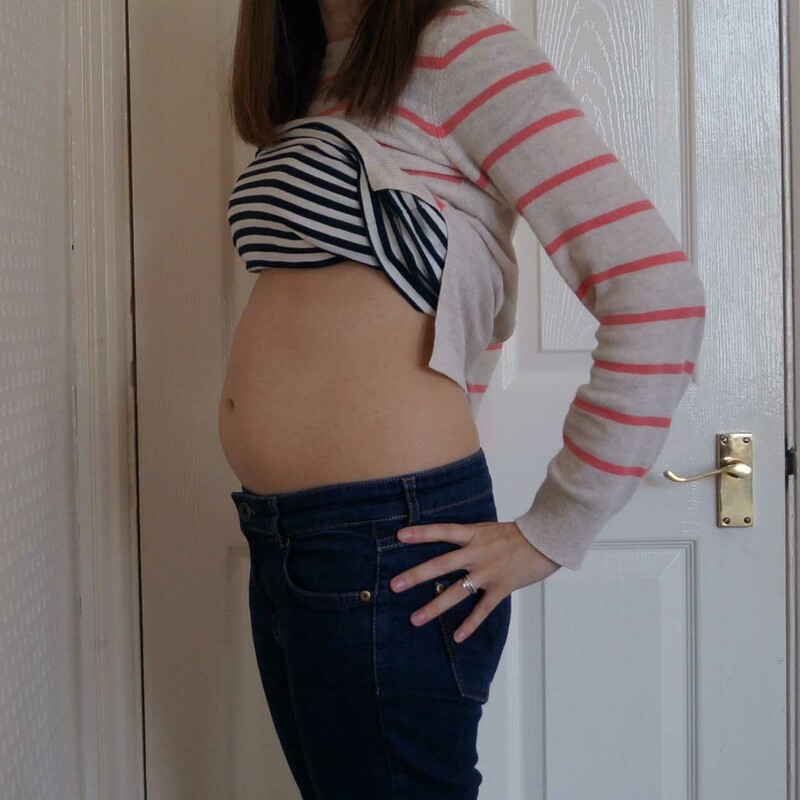 My body: With my first pregnancy my belly button popped out and it looks as though it’s starting to happen again. My husband called it ‘5p’, so it’ll be back soon! Any mood swings? Mostly happy but I get a bit emotional if I see, hear or read something sad and occasionally a bit moody! I’m looking forward to: being able to talk to the baby. Andy talked to Annabelle all the time when she was in my tummy and she always knew his touch too as she would rarely move for anyone else. Your bump looks like mine did at 12 weeks! Does that make us bump twins? 😉 P.S. My husband is hoping for a boy so fingers crossed that’s a good sign. Thank you. I’m glad 10pm isn’t early. I guess cos I go to bed before my husband and even my mum, I thought it was early. I would like to stay up later but just don’t have the energy! It is starting to feel very exciting now that my health is better. Before I was so miserable and tired but now I feel human again and enjoy my food, which I really do, it’s so nice to be pregnant. I’m very glad Annabelle is going to be a big sister. She’s so sweet with younger children that I’m sure she’ll be a very good big sister. I think 10pm is a reasonable time to turn in if you’re getting up at 6 or 7 in the morning. I tend to go to bed at 12 or 1, which is really bad.